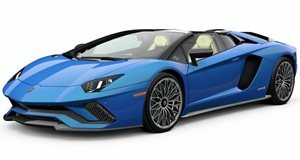 Almost a year to the day after selling a 50th anniversary edition Aventador Roadster finished in Rosso Mars, Lamborghini Newport Beach has a model, originally finished in matte black, wrapped in a gorgeous shade of Gloss Baby Blue for sale. With special SV features, like a carbon-fiber front splitter, and 20 horsepower more than the ‘standard’ Aventador, this version produces 720 hp from its 6.5-liter V12, and also receives a modest engine calibration over bone stock Aventadors. The changes also make this beauty - fitted with a black leather interior - 50 percent more efficient than other Aventadors. It will rocket from zero to 62 mph in just 2.9 seconds, topping out at a max speed of 218 mph. 200 units of the 50 Anniversario edition were made. 100 were roadsters, and this is #51.